This Duangdao Jarujinda movie page contains 7 records. This movie is a Thai Tom Yum (ต้มยำ) western mixing action and comedy. Following a robbery, ruffians have to stop at a house to rest at night time and repair their car. They kill the whole family living there but the kid, called Yot, is only injured and promises to take revenge. He notices that the killer is wearing particular boots. Yot is rescued and healed by a Buddhist monk and doctor Meng (Adul Dulyarat). Twenty years have passed. Yot (Sombat Methanee) is coming back in the area to sell medicine. The area is under the control of mafiosi Lit and his thugs (Pipop Pupinyo and Chat Mongkolchai). Even local subdistrict headman (กำนัน) Cha (Prachuap Ruekyamdee) has difficulty to get authority from them. The district officer (นายอำเภอ) has been killed. The doctor Meng now indulges into alcohol to forget his worries. His wife, Busuba (Metta Roongrat), was deceitful and caused the death of his best friend. She is now Lit's girlfriend. A Thai country music (ลูกทุ่ง) singer (Sayan Chantaraviboon) is coming in the village and teams up with Yot. Lit (Sawin Sawangrat) tries to get rid of Yot, the country music singer and even local subdistrict headman Cha. Yot finds the 20 years old boots in Cha's barn so he believes that local subdistrict headman Cha is responsible of his parents' death. Various events (doctor Meng, Lit and Busaba die) happen until the thugs are neutralized thanks to Yot and the singer, who is in fact an undercover military officer. Remembering the Buddhist monk's advice, Yot doesn't do self justice and becomes the new district officer. 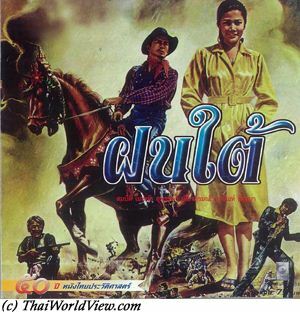 It is a typical movie of end of 1970s decade with Thai country music songs, action, comedy, romance (Yot and Chewi (Supansa Nuengpirom), local subdistrict headman Cha's daughter), revenge. A previous version of ฝนใต้ was also done in 1970 already with Sombat Methanee. 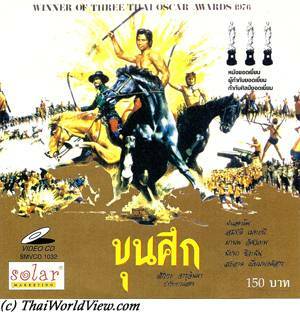 Thai movie ยอดมวยสยาม or “The greatest Thai boxing” was released in year 1973. It is a Taiwan | Hong Kong production. It is named 潮州拳王 - "The greatest Thai boxing" or "Boxer King of Chaozhow". It lasts 1h29mn09s. The movie is lost in Thailand but can still be seen at the Taiwan National Film Archive Foundation. It features Thai actor Sayan Chantaraviboon and Thai actresses Duangdao Jarujinda, Khomapat Attaya. A summary is available in Chinese.